Croatia's political and cultural heart, Zagreb is the country's capital and a thriving and energetic city, which hosts some of its top (and quirkiest) museums, shopping, dining, and cafe culture. Zagreb is also a city made for wandering, with most of its main things to do found in the city center. This consists of two main sections: Gornji Grad (Upper Town) and Donji Grad (Lower Town). Gornji Grad lies on a high plateau and is where you'll discover Zagreb's cathedral and parliament building, while Donji Grad is a more modern area, which is known for its world-class museums and is home to the Croatian National Theatre. A good place to start your Zagreb adventure is in Trg Bana Jelacica, the city's main square where the Upper and Lower Towns meet. Here, you will also find the colorful Tkalciceva Street, which is filled with sidewalk cafes and restaurants, as well as boutique shops. And if you like museums, you'll love Zagreb, which hosts some truly unique ones. Find the best places to visit in the city with our list of the top attractions and things to do in Zagreb. The splendid cobblestone streets and red-tiled roofs of the buildings in medieval Gornji Grad, Zagreb's Upper Town, make for a beautiful place to begin a sightseeing tour of the Croatian capital. Once two separate towns known as Kaptol and Gradec, Gornji Grad is home to many of the city's most visited tourist attractions, including the cathedral, parliament building, and numerous museums and churches. Make sure to stroll along its most famous street, the colorful Tkalciceva Street, which is filled with sidewalk cafes and restaurants, as well as boutiques. Other highlights include Kaptol Square, notable for its many early 17th-century buildings, and the Dolac fruit and vegetable market. Perhaps the most striking feature, however, is St. Mark's Church, easily recognizable by the brightly colored tile roof bearing the coats of arms of Croatia, Dalmatia, Slavonia, and Zagreb City. Be sure to also pop inside for a look at the stunning interior with its statues by famous Croatian sculptor Ivan Mestrovic, along with frescoes painted by Jozo Kljakovic. Zagreb Cathedral was erected on the site of a previous structure destroyed by the Tartars in the early 1200s. Famous for its two ornately decorated spires, the present cathedral was built in the later half of the 13th century, although many alterations and renovations have been made since that have changed the structure dramatically. Most recently, the earthquake of 1880 destroyed large sections, including the dome and bell tower, although reconstruction maintained the original medieval design. Be sure to also visit the cathedral treasury with its many fine works of religious art, garments, and sacred objects. Beyond its many fine art and history institutions, Zagreb boasts some really unique and quirky museums that are well worth visiting. At the top of the list is the poignant yet funny Museum of Broken Relationships (Muzej prekinutih veza). Here, you will find fascinating collections of donated personal objects and artifacts from old lovers and partners around the world. They are displayed in all-white rooms, and each donation is accompanied by details of the failed relationship in question. After touring the museum there is an adjacent shop with some really unique gifts, as well as a cafe with sidewalk seating. In summer there is even jazz on Thursday nights. Built to guard the southern gate of the Gradec town wall, the Lotrscak Tower (Kula Lotrscak) dates to the 13th century and has long been one of Zagreb's most recognizable landmarks. Legend has it that this large, square Romanesque tower once held a bell that rang out each night prior to the closing of the gates to warn residents outside the walls to return (anyone left outside would have to remain there for the night). In the 19th century, a fourth floor and windows were added to the tower and a cannon placed on its roof, which has since been fired every day at noon. Visitors can climb the tower for stunning views over the city and visit its exhibition gallery and gift shops. Another important medieval structure is the famous Stone Gate (Kamenita Vrata), the last of five original city gates, and also found in Upper Town. Built in the 13th century, the building famously survived a fire in 1731, as did its painting of Mary and Jesus. To commemorate the important relic, a chapel was built to house the painting, which has been the subject of pilgrimages ever since and can still be seen behind a metal grille. The Museum of Mimara (Muzej Mimara) was created to house a collection donated by a private collector, Ante Topic Mimara, in 1972. In an 1895 Neo-Renaissance building designed especially for it, this extensive collection covers a wide range of items from a variety of locations and time periods, including a fine archaeological collection containing pieces from Ancient Egypt, Mesopotamia, Persia, the Middle East, the Far East, India, as well as Inca and Pre-Inca South America. There's also a large glass collection from Europe and other Mediterranean countries, along with furniture from the Middle Ages and sculptures from ancient Greece. Paintings include works by Dutch artists Rembrandt and Ruisdael, Italian artists Raphael and Veronese, Flemish painters Rubens and Van Dyck, and Spanish painters Velázquez and Goya. French and English artists are represented by the works of Renoir, Degas, Boucher, and Delacroix, while notable sculptures include works by Auguste Rodin and Jean-Antoine Houdon. Zagreb's Art Pavilion (Umjetnicki Paviljon), built for the international exhibition in Budapest in 1896, was given its permanent home here after the original iron framework was transported and reconstructed on its current site. Notable for its colorful yellow Art Nouveau exterior, the Art Pavilion is now used for changing exhibitions of contemporary art and contains important works by revered Croatian artist Ivan Mestrovic. The oldest exhibition hall of its kind in Croatia, this impressive facility faces Trg Kralja Tomislava, a large public square notable for its statue commemorating the first King of Croatia. Also of interest to art lovers is the Mestrovic Gallery (Atelje Mestrovic), housed in a 17th-century home where Ivan Mestrovic once lived and sculpted. On display are some 300 sculptures in wood, stone, and bronze, as well as drawings, furniture, and lithographs representing a variety of themes, including religion and portraiture. The most recognized Croatian artist and a world-renowned 20th-century sculptor, Mestrovic later moved to Paris where he became friends with Auguste Rodin (one of his most famous works, Pieta Romana, is on display in the Vatican). Another one of Zagreb's quirky museums, the Croatian Museum of Naïve Art (Hrvatski Muzej Naivne Umjetnosti) is also very popular. It features many displays of works by such well-known "naïve" artists as Ivan Generalic, Mraz, Mirko Virius, and Smaljic. Also on display are similar style works — sometimes referred to as "primitive" art — by international artists. Despite the name, naive art was actually a style that was popular in what is now Croatia, as well as the world, in the 1960s and 1970s. It is less popular today but refers to a genre of art that has a dreamlike quality with lots of color. Built in 1895 by Viennese architects Hermann Helmer and Ferdinand Fellner, the Croatian National Theatre (Hrvatsko Narodno Kazaliste) sits at the northwest corner of Zagreb's "Green Horseshoe" in Donji Grad. Officially opened in 1894 by Austro-Hungarian Emperor Franz Joseph I, this imposing yellow structure in Trg Marsala is a landmark feature in the Lower Town. Built in Neo-Baroque and Rococo styles, with two small domes at the front and a larger dome towards the back, the building also boasts a superb interior containing artworks by Vlaho Bukovac and The Well of Life by Ivan Mestrovic. If possible, try to attend one of the venue's regular opera, ballet, or drama performances. Designed in the style of an old English garden, Maksimir Park (Maksimirska) is a beautiful green space encompassing almost 45 acres. The largest park in Zagreb, it contains two pavilions: Bellevue Pavilion, built in 1843, and Echo Pavilion, added after a Swiss design. The park also boasts many excellent paths and trails, as well as manmade lakes, wooded areas, and flower gardens, making it a great place to relax or have a picnic. For those traveling with youngsters, there's also a small zoo. Referred to by locals as Zagreb's "living monument," Maksimir Park is named after Bishop Maksimilijan Vrhovac, who was responsible for its construction in 1794. Across from Maksimir park is the Dinamo Football Stadium where Croatia hosts international matches. With its focus on Croatia's rich history, Zagreb's Archeological Museum (Arheoloski Muzej) boasts five main collections containing some 400,000 pieces, many of which are from the local area. Of particular interest is the museum's display of Egyptian mummies (the cloth from the Mummy of Zagreb shows script that has yet to be deciphered), Greek vases, and a medieval section focusing on the Great Migrations of the Peoples. One of the most important pieces is the Head of Plautilla from the ancient town of Salona, as well as an extensive coin collection, including Greek, Celtic, Roman, Byzantine, and modern pieces. Also of interest is the Ethnographic Museum (Etnografski Muzej) with its extensive collection showing the cultural history of Croatia through exhibits of ceramics, jewelry, gold, musical instruments, textiles, tools, weapons, and elaborate costumes. The traditional folk costumes alone are worth the visit, with various colors and styles illustrating the country's regional diversity. The City Museum (Muzej Grada Zagreba), in Zagreb's Upper Town, consists of the Convent of St. Clair, a tower from the 1100s, and a 17th-century granary. Built along the eastern town wall, the museum has been in operation since 1907 and houses 12 collections, including almost 75,000 pieces. Together the collections describe the history of Zagreb through documents, maps, art, archeological finds, and other historical pieces, including a superb scale model of the old town of Gradec. The City Museum also has interactive exhibits to interest children, including fun hands-on workshops and a playroom. The Jesuit Church of St. Catherine was built in the first half of the 17th century and is considered one of the finest churches in Zagreb. Highlights include its beautiful interior with many fine examples of Baroque art, along with stucco reliefs by Italian artist Antonio Quadrio dating from the 1720s. Also of note is the ceiling of the nave with its many medallions with scenes depicting the life of St. Catherine by Giulio Quaglia. Other features of interest are the Altar of St. Ignatius by Francesco Robba and, behind the main altar, the fresco St. Catherine Among Alexandrine Philosophers and Writers by Kristof Andrej Jelovsek, dating from 1762. The Botanical Garden (Botanicki Vrt) was originally built as a research area for Zagreb University's Faculty of Botany. Encompassing some 50,000 square meters, it's part of a series of parks, which form the city's "Green Horseshoe" in Donji Grad. On the grounds are an arboretum, two ponds with numerous aquatic plants, an ornamental bridge, and some 10,000 different plant species, making for a pleasant escape from the city and a great place to relax or take a walk. Afterwards, if you have energy left for another museum, take in the nearby Natural History Museum (Hrvatski Prirodoslovni Muzej). Housed in the Amadeo Palace built in the early 1700s, the museum boasts some 2.5 million pieces, including minerals from around the world, an extensive zoological collection documenting a variety of plants and animals from Croatia, and finds from local archaeological digs. Zagreb's Gallery of Modern Art (Moderna Galerija) is in Donji Grad in the splendid Vraniczany Palace, built in 1882. Home to numerous fine works by 19th- and 20th-century Croatian artists, the Gallery of Modern Art opened in 1973, although the institution dates from the early 1900s when it began acquiring important pieces by such artists as Ivan Mestrovic, Mirko Racki, and F Bilak. The collection has grown through the years and now displays works by Ljubo Babic, Miljenko Stancic, V. Karas, M. Masic, Emanuel Vidovic, and a host of other well-known Croatian artists, along with frequent temporary exhibitions. Luxury Hotels: Esplanade Zagreb Hotel is the top pick for historic luxury. It features a glamorous Art Deco lounge and old-world charm throughout. Rooms are comfortable and come with amenities like L'Occitane toiletries. There is also an excellent on-site restaurant. The elegant Sheraton Zagreb Hotel in Zagreb's city center is another luxe choice located within walking distance of major sightseeing attractions like the Main Square. It has spacious and contemporary rooms and suites. Also check out Hotel Le Premier, which offers a high-end boutique experience inside a circa 1923 palace. Mid-Range Hotels: Hotel Jagerhorn is Zagreb's oldest hotel and an excellent mid-range choice in the city center. This boutique property has lots of character and just 18 rooms that are individually decorated. Hotel 9 is another option in the center of Zagreb. It is also a boutique property and has contemporary rooms with modern minimal decor. Finally, Hotel Jarun is a good-value choice, which is popular with families. It offers spacious and modern rooms and features an on-site restaurant. Budget Hotels: Hotel Rebro is a top budget pick, which is really good value. Rooms are comfy and hip and there is a free breakfast buffet. Also try Hotel Slisko for a budget choice. It's within walking distance of the main bus station and comes with spacious, clean, and comfortable rooms; complimentary breakfast; and an on-site restaurant, cafe, lounge, and spa. There are a number of great day trips on offer from Zagreb that are handy if you want to base yourself in the city for a few extra days and explore around it. These tours include an expert guide, transportation, and hotel pickup and drop-off. Plitvice Lakes National Park Day Trip: One of Croatia's top natural attractions, this stunning national park has been designated a UNESCO World Heritage site. 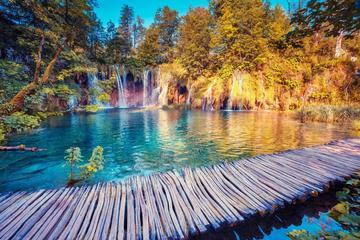 Book a full-day Plitvice Lakes and Rastoke tour from Zagreb to explore this scenic landscape. This 11-hour tour has you walking through the park and cruising across Kozkaj Lake, among other activities. 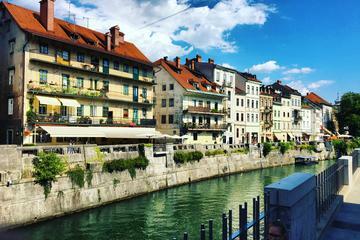 Ljubljana and Bled Day Trip: Another excellent day trip option is the Ljubljana and Bled Day Trip small group tour from Zagreb, which takes you to nearby Slovenia and two of its most popular tourist destinations. Exploring the Dalmatian Coast: The Dalmatian Coast is Croatia's most popular tourist area. Here, you will find the country's most impressive medieval town, Dubrovnik, which also served as the set for some Game of Thrones episodes. For more on exploring this amazing city, check out our article on the Top Tourist Attractions in Dubrovnik. Another top destination on this stretch of coastline is the dynamic city of Split. For more on how to experience this historical city, see our article on the Top Tourist Attractions in Split & Easy Day Trips.